Attraction Introduction: Surrounded by the Catskill Mountains in the town made famous for peace and music, Woodstock Farm Animal Sanctuary provides shelter to cows, pigs, chickens, turkeys, ducks, sheep, goats, and rabbits who have been rescued from cases of abuse, neglect and abandonment. We are a place where visitors can come face to face with the animals they may only know as dinner and learn about the devastating effects of modern-day agribusiness on the animals, the environment and human health. Here you can frolic with goats in a large open pasture, sit down with a pig who wants nothing more than a belly rub, cuddle with chickens who seek out your attention or get nuzzled by some very friendly sheep! At the heart of our mission is the hands-on work of rescuing, rehabilitating and caring for farmed animal refugees — as well as educating the public about the horrific treatment of animals who are raised for food. 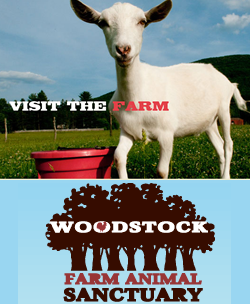 Visit the web site for more information about Woodstock Sanctuary and hours of operation.